Dental Exams & Cleanings | Huntington Beach, CA | Dimitri Bizoumis, DDS, Inc. Learn How Dr. Dimitri Bizoumis Conducts Your Child’s Dental Exam in Huntington Beach! From the emergence of their first tooth, your child can begin receiving regular dental care. Dr. Dimitri Bizoumis is a pediatric dentist, located in Huntington Beach, who specializes in your child’s oral hygiene. We perform comprehensive dental exams on a bi-annual basis and practice preventive care by educating our young patients and their parents about the importance of everyday oral health. 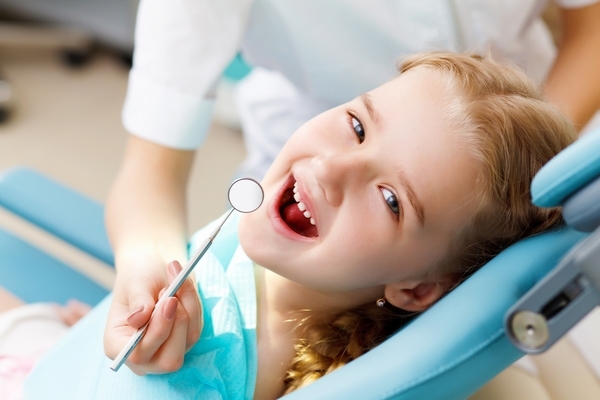 A dental exam for kids usually involves checking the teeth for any decay as well as examining the child’s bite, gums, and jaw. Your child will have their teeth cleaned and, if necessary, be given a fluoride treatment. Your child’s dental checkup is also a way for the doctor to discuss with you any dental developmental issues your child may have, along with proper dental care that should be practiced at home. Most importantly, regular visits to the dentist allow your child to familiarize themselves with the office environment and become comfortable with their dentist and the treatments provided. If your child is visiting the dentist for the first time, we will introduce them to Dr. Bizoumis and our staff. We also encourage parents/guardians to sit with their child during their dental exam so that they are as comfortable as possible in our treatment rooms. We perform a thorough cleaning and fluoride treatment, discuss any necessary treatment options and schedule a follow-up appointment within six months. If your child has orthodontic issues, we will schedule a complimentary orthodontic consultation with our on-staff orthodontist and design a treatment plan that suits your child’s dental needs. Performing a thorough examination while the child’s mouth is developing is important for preventing possible oral health issues in the future. We keep record of and discuss any possible oral health problems that may arise later on and take preventive action to make sure your child retains a healthy smile. Ultimately, our goal is to build a positive relationship with you and your child so that they may receive the dental care they deserve. If you would like more information about our services or to schedule your child for a dental exam and cleaning, contact Dr. Dimitri Bizoumis in Huntington Beach today!